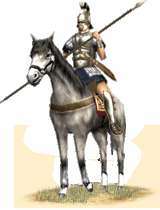 Hippeis Xystophoroi are a small, elite group of noblemen that fight as heavy cavalry using shock force to hit and roll up enemy flanks. The Hellenikoi Hippeis Xystophoroi follows the practical need of a heavy cavalry to counter that of the hostile Makedonian neighbor. While not quite as well trained or lethal as the Makedonian heavy cavalry, they are still a battle-winning component of any army. They are armored in a bronze cuirass, helmet, and greaves and carry the deadly xyston lances and kopis swords. They should be used as any heavy cavalry should be, as a shock force to hit and roll up enemy flanks. Though they are well suited for the job, they still lack the élan and martial prowess of the Hetairoi that the Diadochoi posses. Historically, the Hippeis Xystophoroi were a small, elite group of noblemen that were used in much the same way as the Makedonian Hetairoi. They were never large in number, but served mainly to check the movements of other heavy cavalry and to hit the flanks of enemy soldiers. They were not used to any major effect, which is testament to their utility. They performed their tasks well enough to be deployed on the battlefield, yet not exemplarily enough to be used in a role that might not be fitting to men of their training and stature.